Sitting around has never been an option for entrepreneur and community leader Tiecha Merritt. She’s been an active go-getter since a babe in the arms of her mom, Lillith Meyers. Ready to run away before the crawl-then-walk phases. 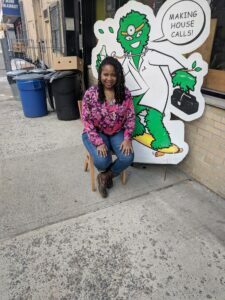 Her “can-do/will-do” attitude is what she brings to The Tompkins Avenue Merchants Association which she’s helmed as President for several years. And it has resulted in TAMA becoming one of the fastest growing business groups in Brooklyn. Nine years ago, a few hundred people showed up for TAMA’s first summer fest Weekend Walk in partnership with the Bridge Street Development Corporation (BSDC) on Tompkins between Halsey and Gates. Impressive. But last summer, with Tiecha steering, the number of celebrants jumped to nearly 3,000 celebrants. This year, the dates are July 20 and August 17. Twenty years ago, while working as a professional in the day care system and fresh out of college, Tiecha decided to activate her dreams of owning a business. She found an empty storefront space on Marcus Garvey near DeKalb. It was during a time in Bed-Stuy history when it appeared the only entities recognizing the area as a business destination back then were Northeast Brooklyn Housing Development Corporation (NEBHDC); BDSC and Community Board 3. Northeast owned the property, and with no one tearing down walls or the space, took a chance on her, giving her a low rent. “I held on to it for two years,” she said noting that she also opened up a boutique specializing in clothing and accessories from African countries. She held on to her day job. Ms. Meyers and her daughter opened The Jazz Spot that next year. With no liquor license, Tiecha developed a skill for mixing alcohol-free beverages to appeal to the jazz crowds that came in, some during the late hours. But mixology became a passion, and her customers expanded. In 2015, She went from smooth jazz to smoothies when she learned of a spot with a nice kitchen area for rent on Putnam with a Tompkins Avenue address. She left that spot for a larger space owned by BDSC further south on Tompkins at 307 near Gates. When she moved, she took her Bush Doctor signage, and her secret ginger-based recipe for what has been called as The Bush Doctor’s fantastic three: ginger beer, salmon burger and veggie burger. She may be the only smoothie bar owner this side of Fulton who that makes ginger coffee. She also makes ginger cocoa and the obligatory ginger beer. But her Witches’ Brew Tea is sworn by as THE medicine for colds. Tiecha gives thanks to many individuals who have helped her go the distance in pursuit of her dreams but the list is too long for this column. At the top, however, are NEBHDC CEO Jeffrey E. Dunston; BSDC President and CEO Emilio Dorcely and Michael Brooks, TAMA’s Vice President and an owner of Bed- Vyne cocktail lounge. So what about the Bush Doctor who guards her juice bar. Is it modeled after anyone? Tiecha informed us that she hired the artist TRUE to give life to her design idea. And that design was inspired by the root doctors indigenous to African culture. “When people get ill in certain cultures they go to healers who know the healthy ways to cure ills. The green is representative of herbs and roots, and they are tied to the food and juices unique to my juice bar. I wanted him dressed in doctor’s clothing,” she said.